Trump – a Pyrrhic victory? Though Trump won a convincing victory in the Electoral College, nevertheless he did lose the popular vote. This will not in any way prevent him becoming President. However it may well make life for him as President a lot less smooth than many are assuming. The votes show that there was no popular swing towards Trump. He barely won the same number of votes as Romney, four years ago. He won the electoral college because Clinton failed to mobilise the core Democrat voters in a few key states – Wisconsin, North Carolina etc. These voters did not swing to Trump, by and large they just didn’t vote. With no popular mandate for his programme, Trump has potentially a lot to worry about, even with the support of a Republican majority in both houses. If Trump wants to win re-election in 2020, he knows that he faces a tough job. The Democrats are unlikely to pick such a divisive candidate again. Their next campaign will not ignore their core voters again. The Democrats have won the popular vote in six of the last Presidential elections. Barring some unexpected 9/11 event, Trump faces an uphill struggle to win again. With the Republicans in control of just about everything, Trump will have no one to blame but either himself or the Republican Party if he fails to deliver on his key promises. Since he is not a stupid person, he will have realised this already. Which may in part explain why he has already begun to soften his language and start to talk about compromises. Even Obamacare may survive. However the key will as ever be the economy. To have any chance of re-election Trump needs to deliver on his promises of massive infrastructure spending and raise the incomes of working Americans. The worrying question for Trump is, can he get his own party to support this? Most Republicans seem to live in a zombie land of voodoo economics, where you can cut taxes for the rich and bring down the deficit. The Republican base is also very hung up on some key issues – immigration, gay marriage, abortion for example. It is not clear that Trump can deliver on all or even any of these. Remember the Republicans are well short of the 60 votes they need in the Senate. All this leaves the Democrats with a strong hand. The majority of the country supports them. America has not suddenly become a racist, misogynist country. At least it is no more racist or misogynist than last week. In just two years time there will be another election for the House and for a third of the Senate. This offers the Democrats a crucial opportunity to wrest the initiative back from the Republicans. The post election statements of Bernie Sanders and Elizabeth Warren indicate the way forward. Can they and their supporters seize control of the party from the current Democrat establishment? Interesting times! Well, not many people saw this one coming. Pollsters and pundits have a lot to answer for. Still the American people have spoken and congratulations to Mr Trump. It may be that for Trump winning the election turns out to be the easiest part. His Presidency may be a lot more challenging than many, including the man himself, imagine. Trump’s success of course has as its counterpart the failure of Hillary Clinton and the Democrats. Though Clinton it seems has, very narrowly, won the popular vote, this is of no consolation or importance. In the USA the Presidency is decided by the Electoral College. Everyone knows this, including Clinton and the Democrat leadership. They failed, end of. Not only did the Democrats fail to win the Presidency, they even failed to win back control of the Senate. It takes some degree of political incompetence to achieve this. Remember Clinton was running as the successor to one of the most respected and popular Presidents of all time. Obama still has very high ratings among Americans. Her opponent was one of the most unfit candidates of all time. Unpopular and even derided by many in his own party. This election should have been a shoo-in for the Democrats. One can only conclude that Clinton herself was the main reason she and Democrats generally did so badly. Right from the beginning of the primary campaigns it was clear that Hilary Clinton was the wrong choice for Democrats. She just carries too much baggage. Some of it good, but much of it bad. She has always been a very divisive person in America. She is also very obviously a key paid up member of the Washington insider establishment. At a time when this establishment everywhere is under unprecedented challenge from outsiders, it simply made no sense to choose Clinton as the candidate. Trump of course played on all this and presented himself not just as the outsider, but one who would bring change, particularly for those who have lost out economically over the past decade or so. As President, Trump now has to deliver on all his promises. A pretty incoherent mishmash of promises it must be said. Massive tax cuts, massive investment in infrastructure – to be paid for how? How will President Trump keep his promises on immigration and what will/can he do about the millions of illegal immigrants already living in the country? A big issue for Trump was free trade deals – it would seem that he does not like them, regarding them as the reason for the decline of American manufacturing. Will he really impose swingeing tariffs on goods from China and Mexico? Can he do this and keep America in the WTO? If he tries how will China respond? Moving away from the economy, Trump is no friend of measures to combat climate change and has threatened to abrogate the recent Paris agreements on combatting this threat to the planet. Let us not even begin to try and make sense of Trump’s pronouncements on foreign affairs. Perhaps his friend Vladimir Putin will help him out here. As was said in another context, lots and lots of unanswered questions. Unfortunately for the rest of us, Trump’s choices will affect not just America, but the world as a whole. Unfortunately for President Trump he will have no one to blame if he gets any of these decisions wrong. The Republicans are now in control of both houses of Congress and able to fill vacancies on the Supreme Court. So from now on the buck well and truly stops with them. As the Chinese saying has it, be careful what you wish for. If Trump as President is the great deliverer he claims to be, then he and the Republicans can look forward to eight or more years of untrammelled power. However, it is not clear that everyone on the Republican side is fully on board all of Trump’s grandiose plans. If things turn out to be more complicated and messy than Trump’s rosy vision of the future, then politics could become very interesting indeed. Republicans in Congress blaming Trump and Trump trying to blame everybody. This election could be the high point for Republicans. Assuming the Democrats have the wit and determination to quickly put together a credible alternative. As minds begin to focus on a possible second independence referendum, lots of voices are calling for us to learn the lessons from the last one. Not enough analysis has been done, some claim, to find out what went wrong in 2014. For what it is worth I am not sure that much went wrong and that moving the Yes vote from around 30 % to 45% would seem to indicate that we got a lot right. There is also the danger that revisiting the past condemns you to fighting last year’s battles, when what you need to do is prepare for the next one. Indyref 2 will be very different from indyref 1. At least we should aim to make it very different. For me, this means above all we must work to ensure that the key message is as simple as possible. We must at all costs avoid getting dragged down into the “so many (unanswered) questions about independence approach”. Dundee University even ran a programme of events entitled 5 million questions. Interesting to note that they did not attempt anything similar, say 65 million questions, with Brexit. There are not that many questions, answered or unanswered about independence. The questions that do get asked, on the economy, pensions etc, are the stuff of daily politics in all countries, and have nothing per se, to do with independence. The key message we must repeat, again and again and again, is that independence is a question of democracy. The question is who gets to decide on the future of Scotland? Our answer is – the people who live in Scotland. That’s it. Pure and simple. Even our opponents recognise this is the strongest argument in favour of independence. Which is why they try to move the debate on to other matters. Something we must strenuously avoid. Now I am pretty solidly convinced that a large majority of our fellow citizens already agree with this. They do want decisions about Scotland to be taken by the people who live here. Unfortunately a significant number remain unconvinced of the underlying strength of the Scottish economy. Which is not altogether surprising, when all the UK parties, and almost all of the media are constantly repeating that Scotland is too wee and too poor to be successful as an independent country. Before indyref 2 we need to have changed this perception. It should not be too difficult. After all Scotland has all the fundamentals to be a sustainable and successful economy. But we need to find a way to convey this in simple, non technical terms. I tend to fall back on comparisons with other similar sized independent countries. Denmark for example is perhaps the closet country in terms of size, population and geographic location. When Unionists say that Scotland is too poor, we should always turn this round. We should constantly ask Unionists to provide the evidence as to why Scotland is not as economically sound and robust as Denmark? What is it that Denmark has that Scotland lacks? We need to move from the defensive and always try and force Unionists into justifying with evidence their claims. In a nutshell this is my recommendation for preparing for indyref 2 – Keep it simple. 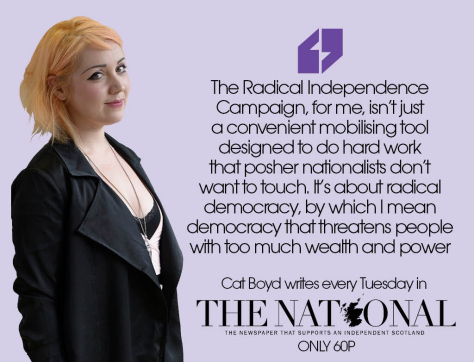 Independence is about democracy and not about specific policies. Scotland has the resources, natural and human to be a successful economy. Force Unionists to provide evidence of the contrary.